Super Glue is scientifically known as “Cyanoacrylate Ester Adhesive“. 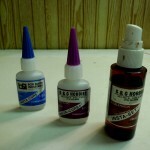 Serious modelers refer to Cyanoacrylate Ester Adhesive by the abbreviation, “CA glue”. CA glue imparts an extremely strong bond, but this powerful adhesive has a potential flaw, a very weak shear strength. For this important reason CA glue should never be used to bond an object that has continual vibration imparted to it from excessive use. An example of this would be a rubber motor shock mount for a Radio Control airplane, ship or car. If the object to be bonded has no vibration, CA glues are an excellent choice. 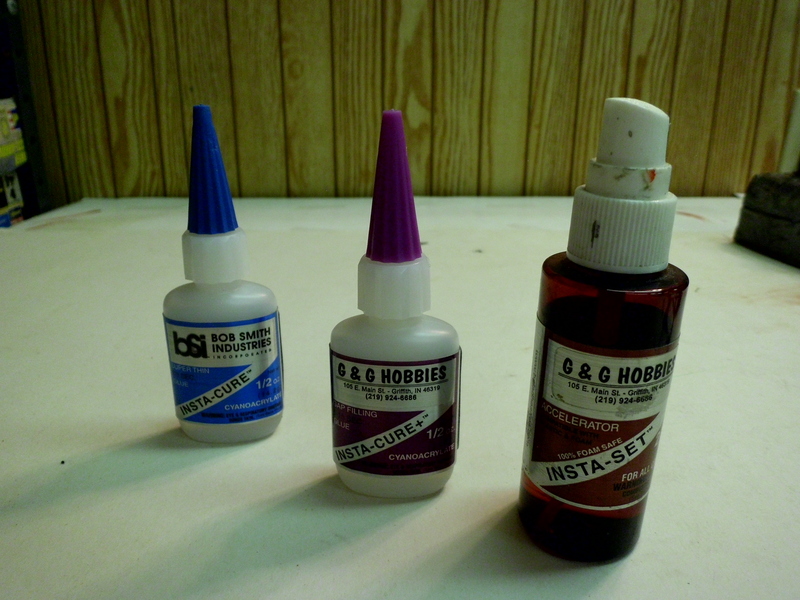 Two different CA glues with different strengths, viscosities, and cure times and a spray type CA glue accelerant . CA glue bonds extremely fast and very low viscosity “thin” CA glue is more runny than water. For this reason when working with low viscosity CA glues, gluing ones fingers to the project is a very realistic problem. The lightning fast cure time of some CA glues can be further increased with the addition of a chemical catalyst known as an, “CA glue Accelerant”. CA glue accelerants should be used with extreme caution. Incredible amounts of exothermic heat are produced by combining CA glue with an accelerant and serious chemical burns are possible. Although CA glue sounds dangerous, when one is knowledgeable of CA glue and it is handled in a safe, mature, and respectful manner, many hobbyist swear by their incredible strength, reassuring predictability, and overall cheap cost.